Brilliant as it was, the twin-turbocharged Ferrari 488 GTB left crankandpiston.com feeling a bit flat. Will we fare better with the Spider? Even for us, this is an obscenely early call time. The clock has barely ticked past 5.30am, yet we’ve already completed the near-two hour drive from Dubai to the neighbouring Hatta mountains for today’s photoshoot. We’ve piled through several large coffees, half a packet of cigarettes, and a few dozen water bottles to be here, now, for this sunrise. 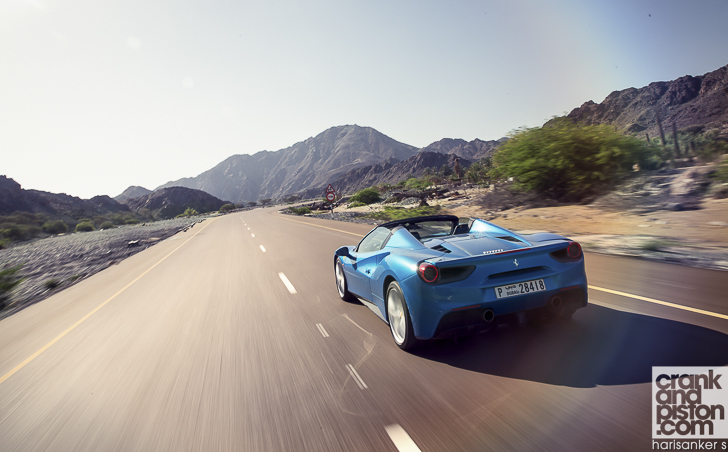 We’ve even attempted to guide a twin-turbocharged Ferrari quietly through Dubai’s slumbering streets without causing too much commotion. Unsuccessfully, I might add. A day with a free Ferrari Spider. It’s an opportunity I’ve no doubt most would kill for, myself included on a regular basis. But for the last hour, I’ve not been elated. I’ve been grouchy. Uninspired. Hell, even angry. There’s still the two-hour drive back to Dubai to go (unlikely before lunchtime at the earliest) and even then, all that entails is two elongated highway cruises. Not exactly the day with a prancing horse I’d hoped for. But then something happens. Something unexpected, something that, weirdly, involves no dynamism on the part of the Ferrari at all. A few minutes ago, dawn was nowhere to be seen, but now a faint glow through the darkness signals its arrival, as does a surprisingly enthusiastic cockerel a few kilometres away. 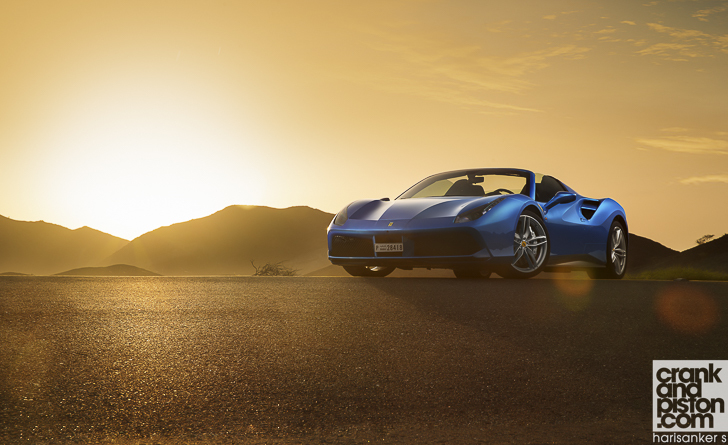 Gradually the sun starts to creep over both the horizon and our weary carcasses, golden rays beginning to dance over our 488 Spider test model. But while crankandpiston.com photographers Hari and Arun scramble to capture the moment on a memory card (or several), I can only stand mesmerised by this spectacle, reminded of a comment a friend of mine made a few years back. He too found himself with a Ferrari Spider – a 458 on that occasion – and spent several hours blasting through the north Italian countryside with only a camera and a V8 soundtrack for company. It was an experience, he explained, that moved him to the point of tears, one he knew he could not adequately prepare himself for nor ever hope to replicate, regardless of place, time or circumstance. Quite honestly, although his description had fascinated me at the time, I didn’t truly understand it: how could someone be so overwhelmed by a car? Even a Ferrari? But now… I’m not sure whether it’s the 488 Spider itself, the landscape rolling out behind us, or the 90 minutes of kip I did manage to grab playing tricks on me, but I think something might have twigged. The looks, unquestionably, play a lead role in this slowly developing realisation. 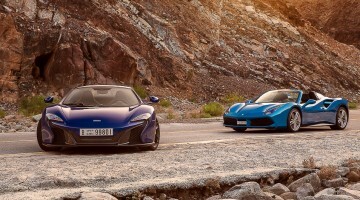 The Retractable Hard Top roof aside, the visible differences between the Spider and its GTB coupe counterpart are few and far between, a set of flying buttresses in place of the glass engine cover the only real item of note. The overall look though remains a striking one, particularly in profile now that the RHT has been stowed and the true effect of that targa-esque styling can be seen. It’s a look both elegant and menacing, accented beautifully by a truly stunning Blu Corsa paint finish that puts even the legendary Maranello Red to shame. Factor ‘golden hour’ into this equation, and it’s an awe-inspiring moment. Might this be the start of what my friend was referring to? These musings are brought to an abrupt halt, and simultaneously encouraged, by the sound of a twin-turbocharged V8 being fired into life. It’s a deep, booming note that resonates across the valley and serves to both startle a nearby flock of birds but also allay the fears many had of Ferrari’s new era. That turbocharged technology would improve fuel economy and efficiency over the retiring 458 was a given, but what of that iconic Ferrari ‘howl’, cried purists? Had we seen the last of that? Clearly not, if my recent shock to the nervous system is anything to go by. The upper reaches of the soundtrack may perhaps lack the same naturally aspirated finesse when the revs are firing in anger, but the chorus that marks Ferrari’s entry into turbocharged terrain is far from a poor one. A prospect all the more enticing given the closer proximity offered by that new RHT roof. There’s no sign of any traffic around us, only a 20km stretch of sinuous tarmac that leads even further into the mountains, the auntumnal colours of the bedrock here set to dissolve into a more reddish hue of rocky outcrop that draws us closer to the Oman border. Time to see if this new Spider can do more than just visually and audibly pluck at my heartstrings. The opening stretch is barely in the bag before the first sensations of the drive sweep over me. There’s more than 100bhp on tap over the retiring 458 Spider and acceleration is more volcanic to the tune of 12 per cent thanks to a revised Side Slip Control 2 that stabilizes lateral motion. As a result, the 488 is on another level. The 3.9-litre unit in the GTB makes its way across unchanged complete with an unhinged 661bhp and 561lb ft of torque, enough for 0-100kph in an identical three seconds and a brisk top speed of 325kph. The visceral kick off the line is just unbelievable, six red ignition lights on the flat-bottomed steering wheel illuminating in unison and that low timbred bark of the V8 cascading to a spine-tingling, harder-edged howl that just oozes charisma. 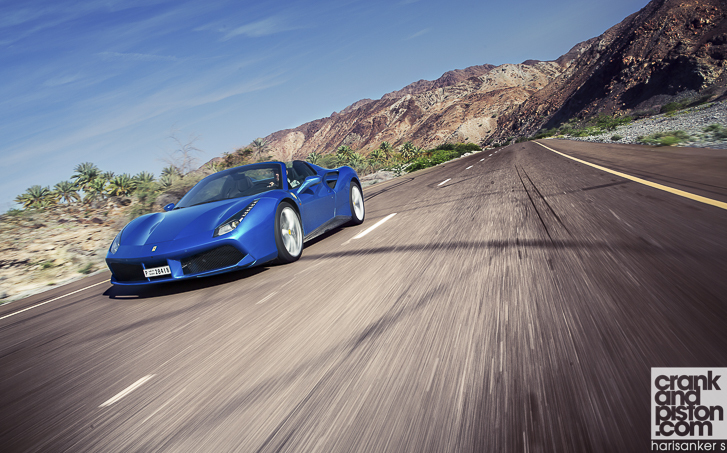 Within seconds, the pursuing camera car is already out of sight, the Ferrari’s digital speedometer leaping almost effortlessly into triple figures as it transforms the surrounding landscape into a blur. Fortunately some carbon ceramic brake discs, derived from LaFerrari no less, offer truly whopping stopping power as well as perfect progression through the pedal. It’s a phenomenal sensation, one made all the more impressive by seamless shifts through the seven-speed dual clutch automatic gearbox. It’s that stout torque curve though that proves to dominate performance as the Spider heads into the first series of corners. Remarkably there is no turbo lag at all, peak torque having been deliberately limited in the lower gears in order to deliver smoother and more linear acceleration. Dear Lord, traction is astounding. Like the start-up, it’s a shock to the system, a delivery of power so aggressive yet somehow so measured. But while the V8’s mid-range muscle is impressive, it’s the Ferrari’s precision through the twisties that marks its raison d’etre. Indeed, built on the same aluminium spaceframe as the GTB and thanks to some astute ballast added both fore and aft, the torsional rigidity of the Spider is almost identical to its sister coupe, the agility similarly eye-popping despite 50kg of weight gain. The upshot is a deliciously neutral balance. Grip at the front is beyond extraordinary, the car’s centre or gravity low enough to scrape the tarmac and the standard adaptive dampers serving up rock-solid body control. Even in its most leisurely setting, the steering is light and quick in a modern Ferrari sort of way, the response through the wheel almost scalpel-like even in the Spider’s most ‘leisurely’ drive mode. Indeed, despite the drivetrain’s visceral nature and the superbly engineered chassis, the refinement of the Spider has also made its mark. Our drive is barely halfway done, but already this is proving to be something very special.